input signals and process them into a number of different signal formats. Incorporating Folsom's Athena proprietary high performance image processing technology, the ImagePRO is available in three models; ImagePRO, ImagePRO-SDI and our fully loaded model ImagePRO-HD. 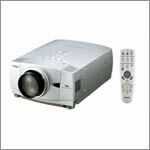 All units are high performance video scalers, scan converters, switchers and transcoders in one. The ImagePRO is the ideal solution for converting RGB, HDTV, component, s-video, composite (NTSC, PAL and SECAM), DVI, SDI and HD/SDI into a user-selectable video format. ImagePRO supports a wide variety of analog and digital output formats including broadcast and VESA standards along with many native plasma formats. ImagePRO users may also create custom output formats to support unique display requirements. The ImagePRO line has an advanced feature set that includes: universal inputs, aspect ratio conversion, memory presets, test patterns, vertical lock (Genlock), picture adjustments, motion adaptive de-interlacing, and 3:2 and 2:2 pulldown detection to name a few. Utilizes Athena™, Folsom's new proprietary high performance image processing technology. External Sync: (Genlock) Input: Blackburst, Computer H/V Sync or C-sync. Sync: RGBHV, RGBS, RGsB, TTL level, Polarity selectable, HDTV. Tri-level Sync supported. 75 ohm Output Impedance. Remote Control Ethernet connection (with TCP/IP) or RS-232 serial port for real-time control.